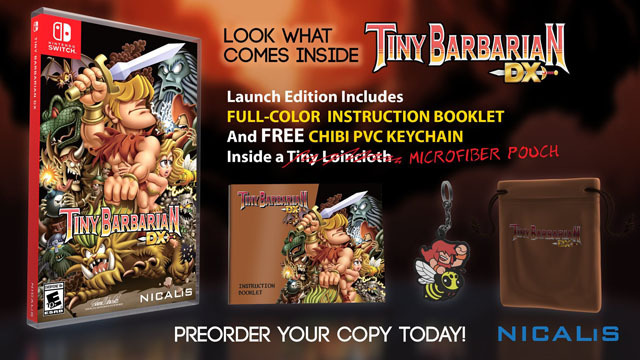 The first episode of Tiny Barbarian DX, from StarQuail Games, was first released in 2013, followed by the second episode in 2014, but fans of the miniscule Conan-inspired warrior have had to wait a long time for the final two episodes, which have just been released. If you already bought the game on Steam, these episodes are available as a free update. Coinciding with this update is the just-released Switch version of the game, which may be downloaded via the eShop, or purchased in physical form. The physical version also includes an instruction manual, keychain, and pouch (pictured below). For a full rundown of the first two episodes, check our coverage here, which we will update with the third and fourth episodes once we finish them.